One of my recent goals, just in time for the New Year? Snacking with a purpose. I tend to stick to whole, nutrient dense foods for breakfast pretty easily. Lunch is typically leftovers or a salad, no problem there. Dinner is either one of the recipes you see here on the blog or a simple meat & veggie situation. When life happens or I'm just not in the mood to cook, we'll do takeout and I'm totally fine with that too- because that's real life and I'm all about balance (and we are lucky to have some great healthy options around us). Snacking is where my diet tanks every now and then, and I have to be mindful of what/how much I'm really consuming. The biggest culprit... chips! Plantain chips, these potato chips cooked in avocado oil, a few too many handfuls of fruit & nuts... I'm sure I'm not the only one! So starting around my third trimester of pregnancy, I decided to focus on "purposeful snacking". If I was really hungry, which I often was because #pregnant, I used that opportunity to sneak in some superfoods or at least a protein source. 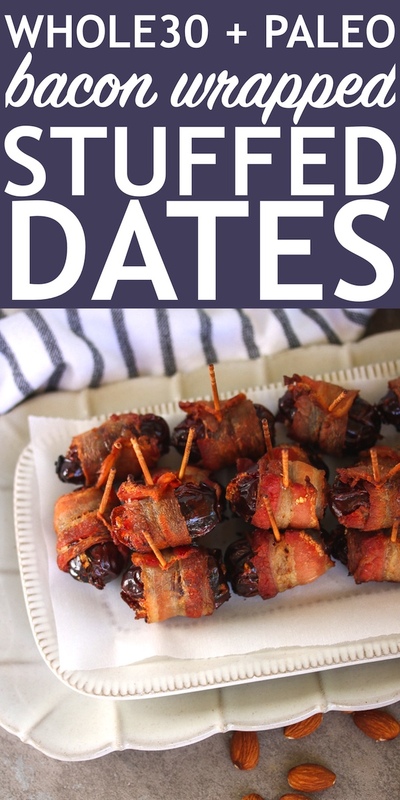 Dates are rumored to have lots of benefits for pregnancy, primarily for easing labor. And I figured if that's even maybe true- why not!? They're delicious anyway! You can read more about dates for pregnancy in this article by Mama Natural. Genevieve has great info and is also who we did our online birth class through! 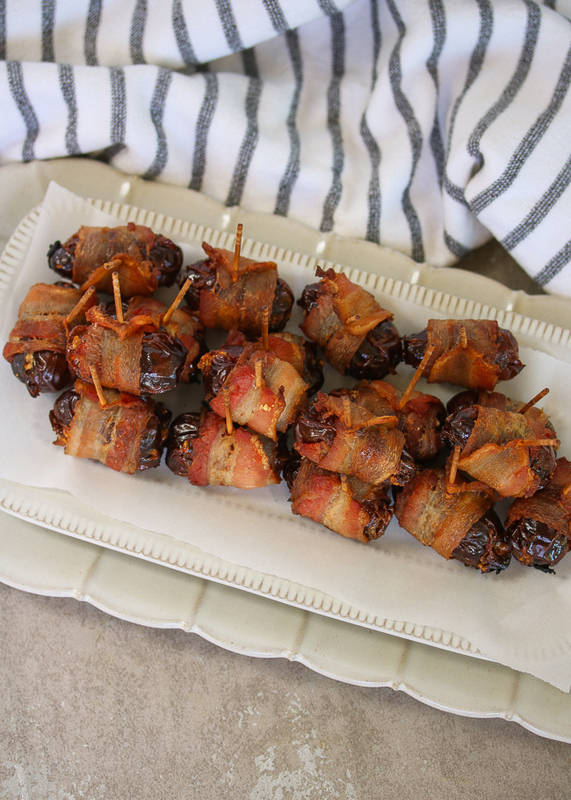 My favorite way to get in my dates was with THESE bacon wrapped babies that are perfect for snack time, but also make the best appetizer. 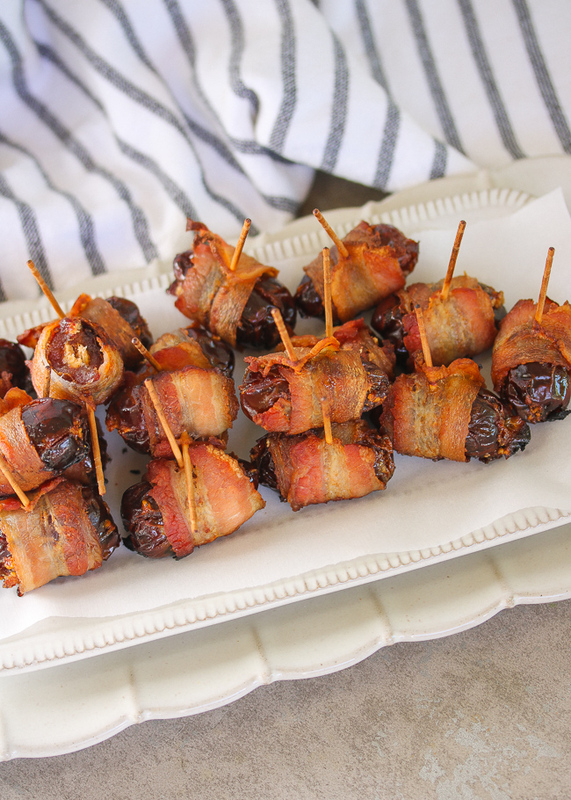 Whether you're pregnant or not, these little two-bite snacks are such a treat- yet so easy to make. 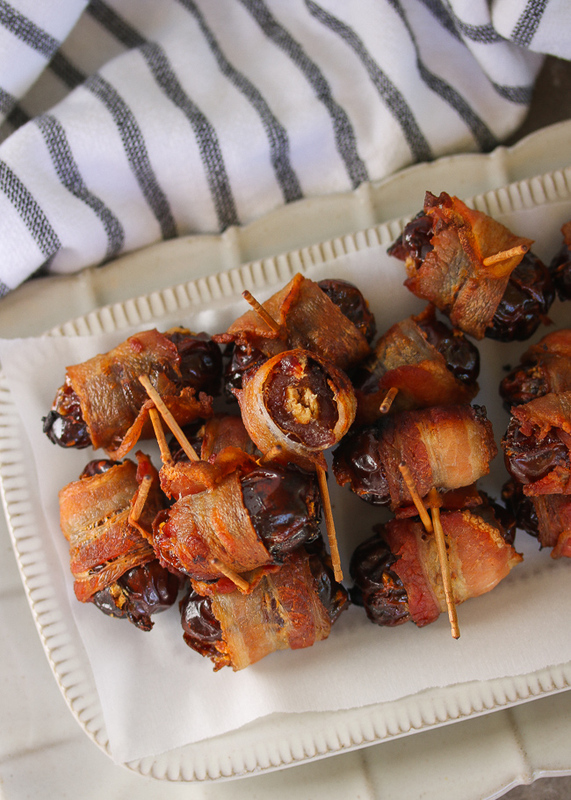 Give them a try for your next gathering (like the superbowl!) or make a batch for yourself to snack on throughout the week. parchment paper, optional but helps with cleanup! Preheat the oven to 425ºF. Line a baking sheet with parchment paper and set aside. Slice the pitted dates in half, and fill with 1/4 to 1/2 tsp of almond butter. I like to sprinkle with a little salt for extra flavor. Cut the bacon in half lengthwise so you half 20 shorter strips of bacon. 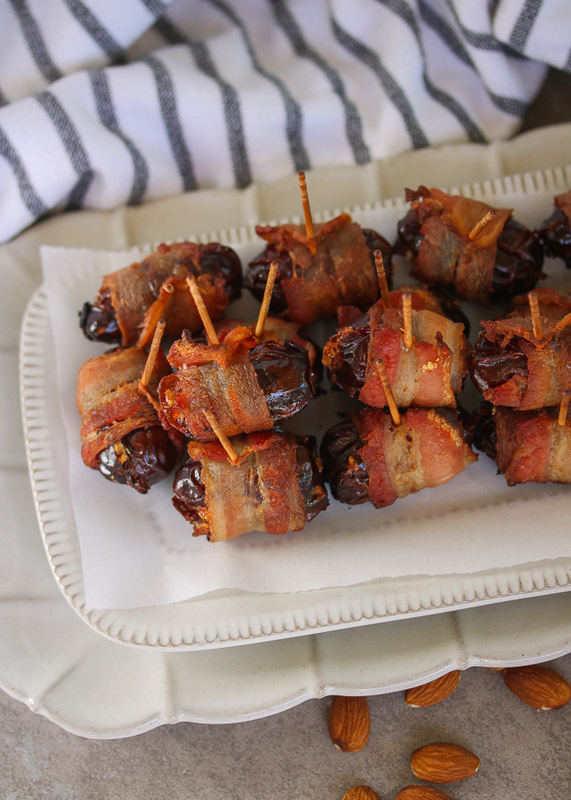 Wrap each stuffed date with a half slice of bacon, and use a toothpick to secure. 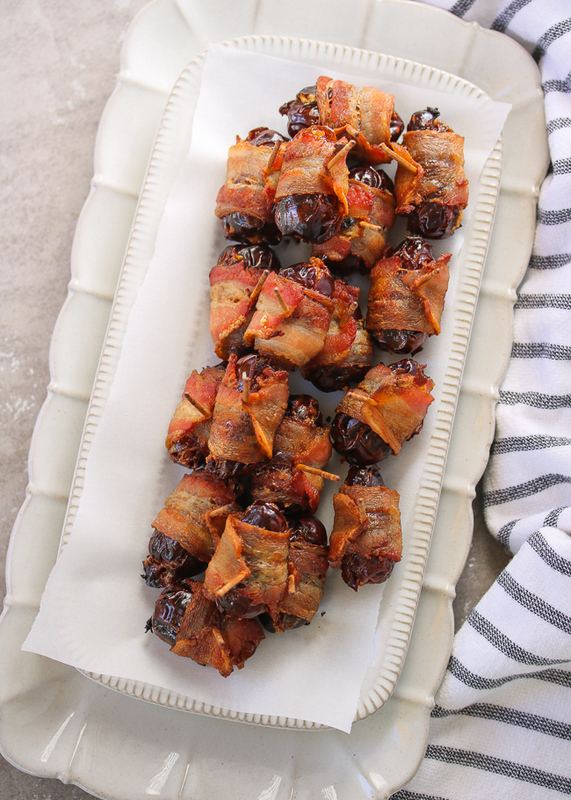 Arrange the bacon wrapped dates on the lined baking sheet and transfer to the oven. Bake for 18 minutes or until the bacon is fully cooked.